April of 2009 marks my 260th consecutive month in prison. Some may think that serving so much time in prison could lead to insanity. I remember reading about the character Dr. Manette in Charles Dickens’ classic novel A Tale of Two Cities. That character went crazy during the 17 years he served in prison. In Aleksander Solzhenitsyn’s classic book, A Day in the Life of Ivan Denisovich, the author articulated the struggle of ten years in prison. I’ve now served nearly 22 years in prison. This ought to bring me an air of credibility and authority when I write that a positive attitude can lead to a positive prison adjustment. This year, I’ve begun more significant efforts to document the steps I take to thrive through prison. As I have done for the past several years, I began 2009 with an announcement of the values and goals that would drive my adjustment. Those guides help me stay on focus, though when conditions require me to modify the goals I set, I do not hesitate. My objective is to emerge from confinement with the skills and resources necessary to succeed. All of my decisions flow to that end. As a consequence of my having clear direction, I still wake each morning with a high degree of energy and an eagerness to make progress toward the goals I set. Rather than limiting readers to quarterly reports, in 2009 I began recording my daily activities. Through my prison journal entries, I invite readers to follow the steps I take each day to triumph over the adversity of imprisonment. Although I do not have access to computers or typewriters, through the discipline of waking early, I succeed in writing considerable amounts of content to help others learn more about prisons, the people they hold, and strategies for growing through confinement. With the inauguration of President Obama, and the more liberal Congress, I deem this effort of writing about the prison experience more crucial than at any time during my imprisonment. I hope to advance the call for prison reform. My sentence is nearly complete, so I may not receive any relief from the prison reform that I feel confident our new leadership will bring. As an American citizen, however, I feel a responsibility to share what I have learned with hopes of contributing to a more enlightened society. Carole and I continue to make investments in our Internet strategy. Through our newly updated blog at prisonnewsblog.com, we’re striving to connect with thousands of citizens each day. As my daily journal shows, I began writing each day of 2009 well before 4:00 AM. In January I posted 92 blog articles. In February I posted 110 blog articles. In March I posted 144 blog articles. My total blog posts in the first quarter was 346. Besides publishing for my own blog, I’ve begun writing for change.org. During the second quarter of 2009 I hope to create additional opportunities that will expand my reach. The more I publish about the prison experience, the more I can help others grasp the urgency of prison reform. Further, by working to expand my network of support, the more I can enhance my preparations to conquer the challenges that will follow a quarter century in confinement. 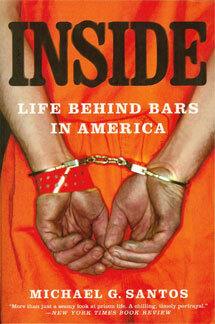 These efforts to reach beyond prison boundaries has led to more interest in my work. Producers from Good Morning Americacontacted Carole for assistance with a story they were putting together on the Bernie Madoff Ponzi scheme. And the distinguished research professor Joan Petersilia invited me to contribute a full chapter for her new book Oxford Handbook on Sentencing and Corrections; I’ll be writing about living in prison. These opportunities opened because I continuously reach out. Prison policies have become more restrictive during the first quarter. I cannot use typewriters anymore to type my manuscript pages. This restriction has exacerbated Carole’s challenge of publishing all the content I write. We’re fortunate to have the support of Josh who has been a saint to assist us with typing and web support. During the first quarter we also began working with a new web design team. They are working diligently to build us a professional platform and to educate Carole and me on effective blogging strategies. During the first quarter I opened a new mentor relationship with Professor Jana Schrenkler. She coordinated a visit with me here at Taft Camp in February and gave me an opportunity to contribute to the literature on ethics. Each month I expect to write at least one article on ethical lessons I’ve learned from white collar offenders who serve time with me. Besides making contributions to Professor Schrenkler’s work, I concluded another semester of working with the students in Dr. Sam Torres’ class at California State University, Long Beach. They used my writing as a resource and I responded to questions they asked through the blog. Since I turned 45-years-old during the first quarter, I scheduled a physical with health services. The end result revealed that I’m in great health, and I attribute that to my exercise routine. In January I ran 284 miles; in February I ran 256 miles; and in March I ran 248 miles. I’ve run every day of 2009 so far, and accumulated 788 miles to date. This puts me ahead of schedule for my goal to surpass the 2,600 miles I ran in 2008. As a consequence of the heavier writing schedule, I have fallen behind with my reading schedule. Thus far I’ve only completed reading six books, and I should have read more. I’ll need to catch up in order to reach my goal of 25. My marriage to Carole continues to thrive through our eighth year together. I may have served nearly 22 years in prison, but I feel more blessed than most. I appreciate the support of all.